​48-year-old Lucas Mongiello is Creative Director and Art Supervisor at Havas Paris, a leading French PR and advertising firm employing around a hundred creative experts in all disciplines. Lucas handles the Alpine (Renault), French Air Force, Château Cheval Blanc (Bordeaux wine producer) and Paris Motor Show accounts, and also plays a hands-on role in development. Having studied at the Estienne School of Art and Graphic Design in the 1980s, Lucas started his career as an illustrator. Pif Gadget (a children’s comic), Télérama, HaraKiri as well as a few obscure fanzines all commissioned his early drawings. One thing led to another, and Lucas bounced from corporate identity projects to graphic design for publishers, as freelancer or for small design boutiques. He tried his hand at street art, furniture design before turning to advertising when he joined MGTB Ayer as Art Director alongside Nicolas Taubes. After 4 years at MGTB, he decided to branch out on his own and founded LALU, a graphic design studio working for both agencies and brands including TBWA for Playstation and Absolut Vodka. Two years later, Lucas turned his attention to the onset of digital, by joining Mediaquest, an early mover in digital that used to create interactive kiosks, cd roms and some of the earliest corporate websites including for Tati, Wanadoo, FT, LVMH and Francofolies. By now, it was the late 1990s and WPP took over pure player Mediaquest which was renamed Ogilvy Interactive. Lucas was appointed deputy CEO and Creative Director alongside CEO Laurent Lilti in the new firm, where he worked on the Dior, Perrier, Vuitton and Dove accounts. Subsequently he was handed further responsibilities that included creative director for OgilvyOne, the new Ogilvy Group direct marketing agency, followed by Ogilvy Healthcare creative director. Mattel, Amex, AirFrance, Nestlé, GSK, Pfizer, Théramex all benefited from Lucas’s creative expertise and he oversaw a 270-strong team during his spell at Ogilvy. But all this was a long way from his yearning for small human-size firms, so teaming up with Pierre Sitbon, he decided to set up a new digital marketing agency called Ministère, which had up to 30 people serving brands such as Chantal Thomass, Carrefour, Château Cheval Blanc and Lactalis. At this time the market was teetering between two different business models - pure-players or integrated marketing firms. Taken over by Laurent Habib, who was building the agency Babel via acquisitions, Ministère became a leading marketing advisory firm. However, Ministère did not settle down with Babel and it embarked on a different path joining Havas Group, and specifically Havas 360. 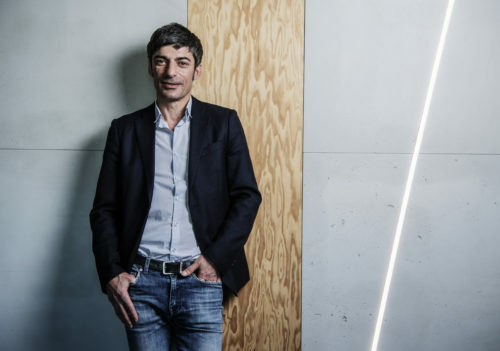 Following the January 2016 Havas 360 / Havas Paris merger, Lucas was appointed Creative Director and Art Supervisor at Havas Paris under Christophe Coffre’s creative leadership, who gave him the task to review the group’s entire creative output across all disciplines including advertising, publishing, branding, identity and digital. Lucas Mongiello was a member of the jury at the 2003 Cannes Festival de la Créativité in the Cyber Lions category.